Kia recently brought us out to beautiful Aspen, Colorado to test drive the all-new 2016 Kia Optima on some stunning mountain roads. This sunny landscape with the lovely fall leaves was a perfect setting for Kia to introduce the redesigned version of the most important vehicle in the Kia lineup. 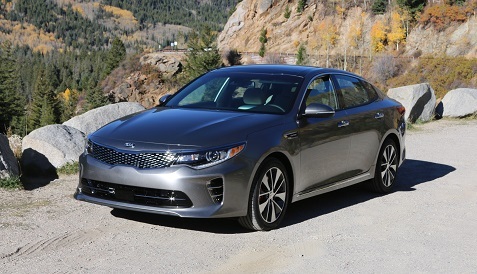 The Optima has been a big hit for Kia and sales continued to increase nicely this past year. Naturally, Kia’s goal is to build on the success of this sharp yet practical mid-size sedan which has become one of the staples in a crowded segment. The design changes to the exterior are subtle, which makes sense given the success of this sedan. Kia only made slight changes to the distinctive front grille that has given the Optima its signature look. The line between the grille and the front headlamps is hardly noticeable in the new design, which gives a more sweeping impression of the front end. I don’t like this quite as much as the previous version, but it’s still a stylish and appealing design that is unmistakable as a Kia Optima. It remains one of the better looking options in the mid-size sedan segment. The new Optima is slightly longer, taller and wider, leading to improved cabin space and more room in the trunk. This vehicle also introduces Kia’s first application of Bi-Xenon HID headlights with available Dynamic Bending Lamps, which illuminate the tarmac around corners, and High Beam Assist. The changes to the interior are more noticeable, with a prominent horizontal plane for the dash with a more user-friendly layout of controls. The seats are more comfortable and there are more soft-touch surfaces as well. I drove a fully-loaded SXL, so the overall comfort level was impressive. The new Kia is also very quiet, rivaling what you would expect from a luxury sedan. A rear-camera display is standard, while you can also add a 360-degree Surround-View Monitor. Other options include Advanced Smart Cruise Control, Blind Spot Detection with Lane Change Assist, Rear Cross Traffic Alert, Rear Parking Assist System, Front Collision Warning System, Lane Departure Warning System and Autonomous Emergency Braking. With Kia’s EVO connectivity system, consumers get access to new features such as Geo-fencing, Speed Alert, Curfew Alert and Driving Score. Also, the new Optima is Kia’s pilot vehicle for the introduction of Android Auto and Apple CarPlay, which allow drivers to access a suite of core functions from their smartphones. It will be interesting to see how this takes off as some car technology seems destined to be tied to our phones instead of the current car we drive. The all-new Optima is available with three engine choices, including two that carry over from the previous generation: the 2.4-liter GDI four-cylinder, available on the LX and EX models, and the 2.0-liter GDI turbo engine, available on the SXL and SX models. The 2.4-liter produces 185 horsepower at 6,000 rpm and 178 lb.-ft. of torque at 4,000 rpm, while he 2.0-liter turbo generates 245 horsepower at 6,000 rpm and 260 lb.-ft. of torque at 1,350 rpm. Both engines come with a six-speed automatic transmission with Sportmatic shifting, and the SX and SXL trims add paddle shifters. The third and new option is a 1.6-liter four-cylinder turbo engine offered on the LX trim which generates 178 horsepower at 5,500 rpm and 195 lb.-ft. of torque at just 1,500 rpm. This new engine comes with a seven-speed DCT, a first for the Kia brand, which optimizes the engine’s responsiveness for a sporty feel that doesn’t sacrifice fuel economy. My test vehicle had the 2.0-liter GDI turbo, and with the winding roads surrounding Aspen, we had plenty of opportunities to push the new Optima, which performed nicely. The handling was impressive, and acceleration was aided by the available Sport option. Other drive options include Normal and Eco, which are now necessary features for many consumers. The all-new Optima is built at Kia’s plant in West Point, Georgia like the outgoing model, and it comes in five trim levels: LX, LX 1.6T, EX, SX and SXL. With the trim levels and options, you can probably find one that fits your budget and tastes pretty easily. The distinctive look of the Optima will keep consumers coming into showrooms, and now, the driving experience will probably keep even more of them interested.